Some people may question the idea of spending a week’s holiday delivering post from a boat, but if that boat is travelling 2,600 km along the Norwegian coast from deep within the Arctic Circle to Bergen and visits some of the most spectacular scenery around, you may reconsider. Two things hit you when you arrive in Norway, one is the total lack of architectural flair, and the other is the exorbitant price of everything. Arriving at the airport, we stopped for a celebratory coffee (€6), before taking the massively clumpy, depressingly somber express in to the center of Oslo (€22, each way). With only 600,000 inhabitants (in a country of 5 million), Oslo does not really have a great deal to offer. We stopped off at the tiny cathedral (still wreathed in flowers following on from the recent shootings), the national gallery (with its depressing Edvard Munch collection), the harbor (an architectural mess, where 23 architects seem to be battling out who can “do” better urban planning) and finally the very boxy, yet interesting town hall, where the Nobel Peace prize is doled out each year. Our next stop necessitated taking a tram, which according to the digital display, could travel through time – apparently it would pick us up, after it had reached at our final destination. Impressive stuff. We took this miraculous contraption to the brilliant Vigeland Sculpture Park in almost no time at all. Here 212 bronze and granite Gustav Vigeland sculptures are, for want of a better word, on display. His work portrays naked men, women and children in various “typically human pursuits” as the catalogue puts it – I leave it up to your imagination. From Oslo, we were off to Kirkenes, the start of the boat trip, home to 3,300 very cold people and about 12 million lemmings. It necessitated getting up very early and taking the Auschwitz Express back to Oslo Airport. On the surprisingly full plane, breakfast was severed. Now, I am used to mystery meat on planes, but this was the first time I had experienced mystery jam. The package depicted just about every type of fruit you can imagine and tasted, well, fruity. This culinary delight distracted us from the bigger issue of not actually arriving in Kirkenes. After 2 aborted landings the pilot had to divert to the metropolis of Lakselv (population 2,146) and we ended up on a 5 hour (340 km) bus ride back to the fogged-in Kirkenes airport. With hindsight was not such a bad thing as the tourist attractions in Kirkenes are few and far between and we could play “count the squashed lemmings” on the road – there were a lot. The next morning it was off to the boat. Well, it would have been, had we not started chatting with some Spaniards and totally disregarded the large canary yellow bus that drove by, pickup about other 20 people and drove off. Hurried calls to the bus station instigated its return, but it was a bonding moment with the Spaniards who we stuck with on the cruise – we were amongst the youngest on the boat. 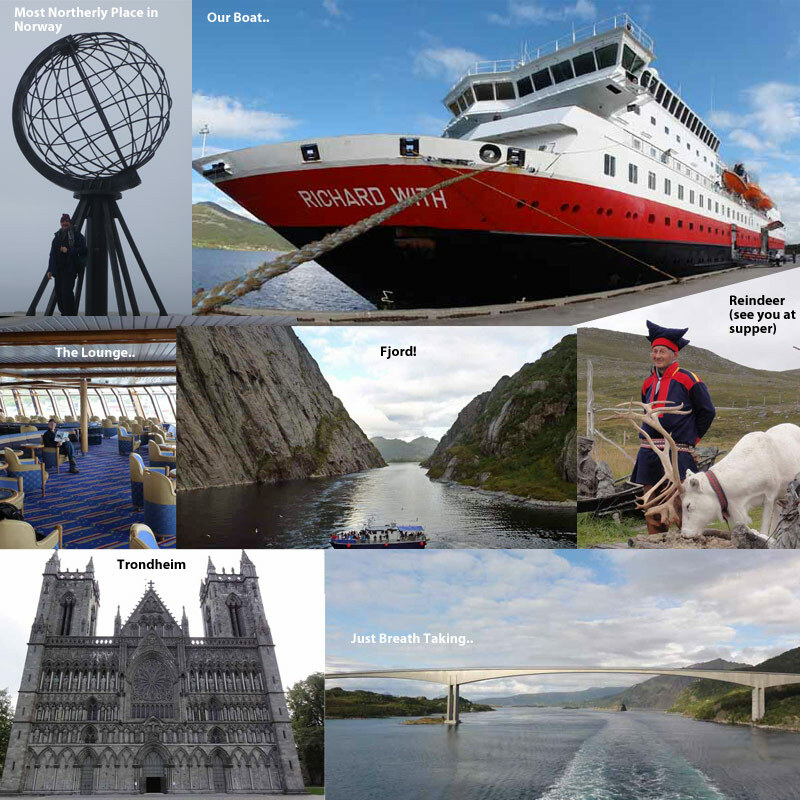 From there the 2,600 km boat ride to deliver post to 30 ports along the Norwegian coast began. Over the next 6 days, we meandered through incredible fjords watching the sites go by and soaking up the Norwegian sun. 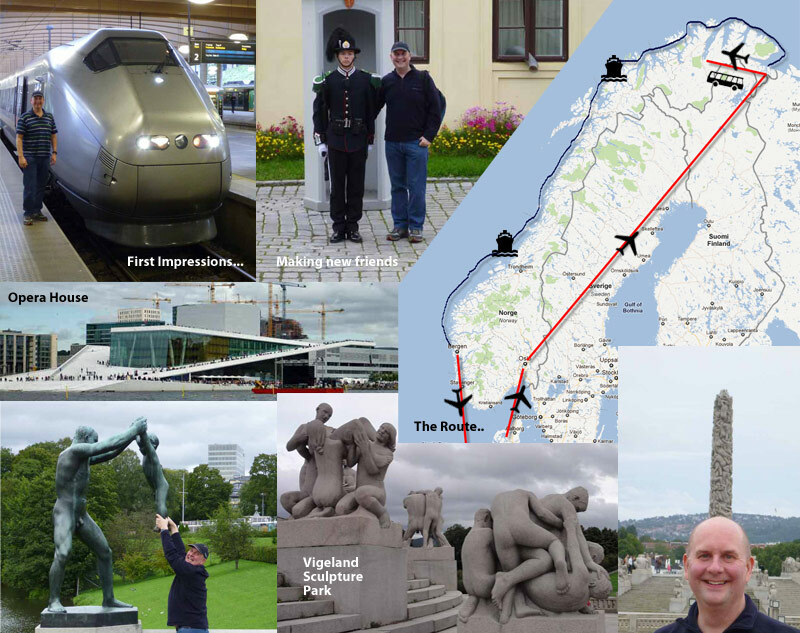 The first few stops had the common theme of “the most northerly…” – the most northerly point of Norway, the most northerly fort, the most northerly mountain with a hole in it, the most northerly methanol plant etc etc. We were also lucky enough to spot the most northerly cat at one point, but it eluded our cameras. Forget the most northerly lemming, there must be a 1,000 vying for this honor. At some ports (where it could not be avoided), we took organized excursions with tour guides who explained every fauna, flora and squashed lemming en route. One question was why houses are typically painted a myriad of different colours, apparently, this was a post war phenomenon. As the Nazis retreated, they burnt everything to the ground and during the rebuilding phase the government subsidized only standard houses shapes. People wanted to personalize their “standard” houses and so started painting them different colours – and presto, picturesque villages. I have never been on a cruise before and don’t ask me where the time went. There always seemed to be a huge backlog of things to do – a quick troll round a local port, drinkies with our Spanish friends, meals, a quick nap on the deck, a chance to get a bit further in that book, a rush to get the best photo of the methanol plant as it glided by.. it was all go. After six days the cruise irrevocably had to come to an end – we arrived in Bergen and disembarked to the first real rain we had seen. The final day was spent exploring this wet, but vibrant city – unfortunately some main attractions were shut. I really wanted to experience the Leprosy Museum (surprisingly, the most northerly Leprosy museum in the world), where I imagined interactive displays and multimedia exhibits, but it was sadly not to be – it had started its winter hiatus. So we checked out the excellent aquarium and the funicular, where we had some break-taking views of fog and drizzle, before heading back to Frankfurt. Another excellent trip that I can only heartily recommend – the only disappointment was again not seeing the northern lights. This may become an obsession with me, so watch out for postcards to come..